Not unlike her sister ships in the Holland America line of cruise ships, the Holland America Ryndam offers passengers sophisticated cruising to many varied destinations. Her onboard amenities offer you activities that inspire and sooth the senses, while her Dutch Worldwide Exploration theme is teeming with art and artifacts from the 17th, 18th and 19th centuries, exquisitely displayed around her public rooms and hallways. The grand 3-story atrium features a stunning fountain as its centerpiece, artfully created by sculptor Gilbert Lebigre. Holland America Caribbean cruises offer guests the chance to see many different island nations on one trip, which is a hallmark of Holland America, as her itineraries are well thought out and offer many ports of call on each sailing. On board, the Holland America Ryndam has the signature of excellence upgrades ensuring that the fittings, furnishings and public places are now better than ever before. Her Southern Caribbean cruises like the 14-day round trip offering from Tampa, FL, offers cruisers ports of call like the Bahamas, Puerto Rico, Antigua, St. Lucia and Aruba, among others. This grand vessel sails on Western Mediterranean cruises like the 14 day Autumn of Riviera Collectors Voyage that travels from Barcelona to Spain with stops throughout Italy, Tunisia and Morocco, to name but a few. Just for good measure, Holland America Ryndam also departs from Dover, England for a 14-day Northern Europe Cruise called the Norse Legends and Viking Sagas Cruise, stopping in many Norwegian ports including Oslo, Flam, Bergen and Eid Fjord. Of course, these are only examples of her many varied itineraries, and she offers many more. Whichever itinerary suits you, the Holland America Ryndam ensures you arrive in sophisticated style, with tastefully decorated cabins and state rooms; a lot with their own private verandas and with more room than you may have been used to on other lines. Her 5-star dining options include the Vista main dining room and like on her sister ships, the Pinnacle Grill. She also has The Mix on board, an interesting set of three distinct bars, one champagne, one martini and one spirits and ales for any special occasion or a quiet drink with friends old or new. Her showroom at sea features Vegas style revue shows during each cruise while her new Digital Workshop allows cruisers a chance to learn something new, technology wise. 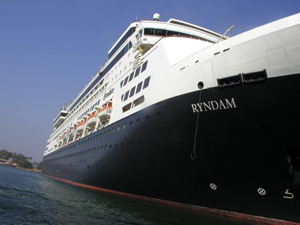 Holland America has taken cruising to a whole new sophisticated level with the Ryndam and her sister ships, proving that the devil is indeed in the details.